Its Tuseday - Garden Prty Time again, where a magazine clipping plucked from the "Inspiration Shoebox" becomes the basis for a card. Sorry this is so late, I'm still recovering from the Holiday weekend. And you know I had to use some justjohanna birdhouses for it! (I used all justjohanna stamps actually). I struggled a pit with the color combo. I ended up using some Crate Paper Carnival patterned paper to try to pull all the colors together. I stamped Fairy Tale Birdhouse 3 times and put Flower Garland Narrow at the base to be the pink flowers in the photo. 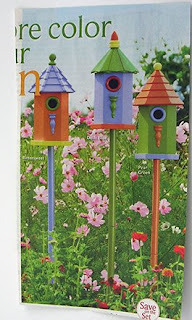 The bird house poles are "doodled" in (can something be "doodled" if you use a ruler??). I also added the sentiment and cute little Sylvie there. The stitching is there because - it just needed something. So here is my Copic tip (sort of....). Whenever I'm going to add "stuff" that I want to color with Copics, I lightly pencil it in and color it first. Then I create the black lines with my marker after the Copic ink dries. I don't have to worry then whether the pen ink will bleed when touched with the Copics. And here is next week's photo. Much more subtle colors. Maybe a shaped card? If you want to play along, just post a comment here with a link to your creation and I'll make sure to point it out to everyone next Tuesday. Wonderful card. 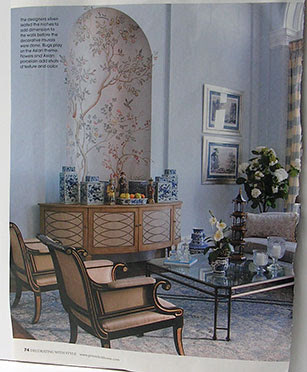 It's so springy and cheerful. I really meant to do the challenge, but I ran out of time. Oh well. So, so cute!!! I really love that card you did! Oh, I'm starting a garden. I can't wait until they're grown. They're just little beans, tomatoes, onions, salad, etc. What a neat card. Awesome job! Gorgeous! So bright and FUN! I love it! I swear, I'm gonna try to do this challenge! Great inspiration! Oh, and loved the birdhouses - so fun and fresh! Very nice job. 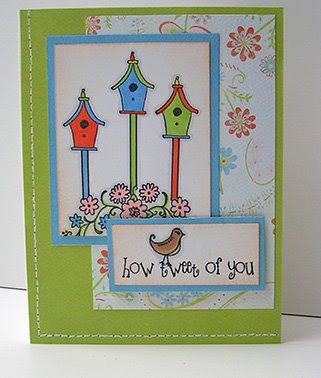 I love this card - both the layout and the colors are wonderful. Great card! It matches the challenge perfectly.